Recently while I was updating my Jolla phone to the latest release. I was asked to optimize the space left of the disk before updating. I did this but my phone got powered off during this process and once it was charged again it went into a bootloop. That is to say that it booted with the Jolla logo and then went to a blank screen and never went further. Upon investigating the issue, I found that the Jolla file system is btrfs and that it was during a btrfs operation the device got turned off causing some file system issues. 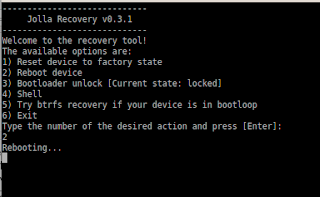 I read over Jolla's instructions on how to reset the device to factory settings available here but I didn't want to reset my device as it had quite a bit of valuable data on it. Luckily they had instructions on how to recover that data available here. These instructions worked for getting data off the device although it took several trips due to the size of my SD card. As an aside always have a backup .vault file on your Jolla it will make this process easier , I didn't and I wonuld have had to write code to retrieve my contacts and message from SQLite DBs had I not been able to fix the device. Which mounted the file system as writable, I then removed my Videos folder as it was safely backed up and would remove 2GB of space form the device. Then I ran sync and umount commands to make sure it was gone and to unmount the file system. 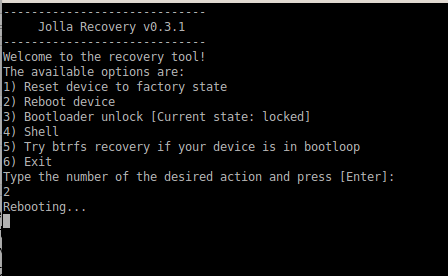 Once I had done this I used option 5 in the recovery console to attempt a btrfs recovery and then I rebooted the device, it took a little while longer than usual to reboot but it's now back to normal and working as expected. I hope this helps anyone else experiencing similar issues. By recover-my-files other than the one on which your files were lost.Run search your drive and preview the files found in the results screen.